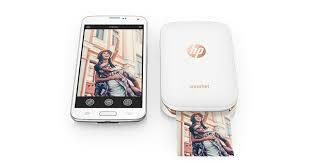 HP launched Photo printer for Smart Phone and Tablets with perfect portable printer. This printer is smaller and liter which fits in pocket with the capability of producing 2*3 stick-able snapshot from smart phone are tablet. This printer works with the bluetooth connectivity which takes less than a minute. The photos which printer by HP Printer are water resistant and smudge-proof which covered by Zero-Ink techology. Here this printer is available with two colors Rose-Gold and Black-silver colors. This is available in Amazon with the price 8,643 Rs according to indian Inr price.